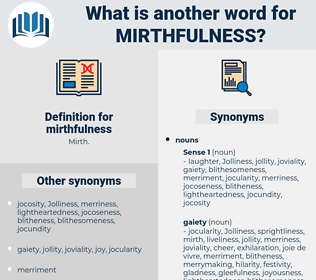 What is another word for mirthfulness? unhappiness, sadness, sorrow, discouragement, work, gloom, depression, dullness, seriousness. dolefulness, woe, sourness, grimness, glumness, Desolateness, graveness, soberness, gloominess, dolorousness, gravity, melancholy, woefulness, mourning, Miserableness, joylessness, forlornness, spleen, misery, darkness, plaintiveness, earnestness, despondence, solemnity, bile, sobersidedness, desolation, wretchedness, Solemnness, dejection, disgruntlement, blackness, heartbreak, blues, discontent, moodiness, mournfulness. This conscious expression, since it was as far as possible from boyish mirthfulness, was usually attributed to insolence or " smartness." Then, with a mischievous mirthfulness usually foreign to his nature, Wolf raised his goblet, exclaiming: " Cast them upon me, Father Blomberg!